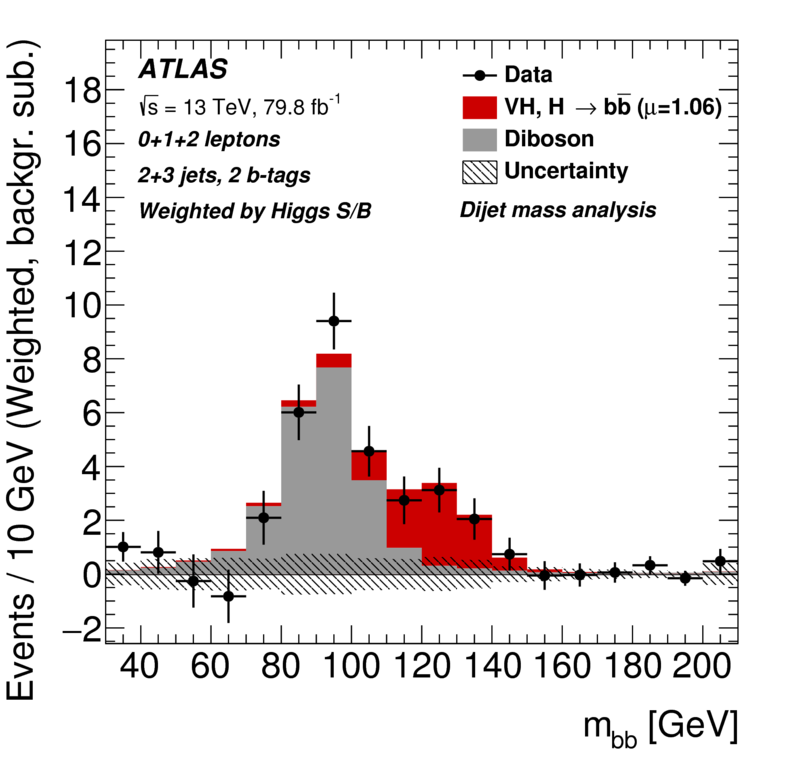 The Higgs boson was discovered via its decays to bosons by the ATLAS and CMS collaborations in 2012 and has since been observed in decays to tau leptons. Until very recently, it had however not directly been observed coupling to the quark sector, which includes its largest decay to a pair of b-quarks. To fully probe the new particle it is vital to directly observe its coupling to quarks and to precisely measure its decay to b-quarks. UCL pioneered this decay channel and has since played a leading role in discovering evidence for the Higgs decaying to a pair of b-quarks. Despite the large branching ratio, this is a very challenging channel, which requires great understanding of the complex and large background processes. However, studying this channel is vital to fully understand the nature of the Higgs boson disocvered at the LHC and to unravel the mysteries surrounding the Higgs sector. The di-b-jet mass peak from the ATLAS VH, H->bb analysis after all backgrounds except for diboson VZ, Z->bb have been substracted. The H->bb signal mass peak (red solid histogram) can be seen on the shoulder of the diboson mass peak (grey solid histogram).